Author Bennett sets up the late Martin Esslin—the dramatist, critic, and theater scholar whose book, Theatre of the Absurd, published in 1961, has been called the most influential theatrical text of the 1960s— as a straw man of pivotal importance. Mr. Bennett then proceeds to toss lighted matches in Esslin’s direction. Most of them miss their mark. The few that hit just sputter and go out. Esslin, our author would have us believe, was the scholarly voice that led us all astray in those dear, dead days when Samuel Beckett and his colleagues were forever altering our vision of theatre, and while Allen Ginsberg was doing the same for poetry. Of course, Esslin, acknowledged as the inventor of the phrase “Theatre of the Absurd,” was not without flaws and a few shortsighted interpretations. The point is that Mr. Bennett doesn’t offer a valid alternative to Esslin’s assessments of the then-emerging wave of absurdist playwrights. Mr. Bennett’s effort-filled, naysaying voice will never drown out the echoes of Esslin’s less didactic analyses. Those echoes have already bounced off mountainsides and theater walls all over the world. Mr. Bennet, standing on the academic edge of the scene and shouting “No!” will not change theater history. The major point of contention in this argument between thesis writer Bennett and his chosen adversary, dead critic Esslin, is the basic nature of the absurdist movement. Esslin said Theater of the Absurd was a movement delving into the absurd. Mr. Bennett views the playwright as a potentially clear thinking, painstakingly precise, analytical academic—much like himself. The Bennett-envisioned wordsmiths place carefully pre-planned, psychoanalytical emphasis on every word and every deed in every play. Is Estragon’s removal of his boot in Waiting for Godot a distracting moment of sad clown comedy that flowed from Samuel Beckett’s pen? No, writer Bennett insists. It is rather a parable in which body position, shoe function, and dialogue merge to reveal the playwright’s sermon on the condition of the world. 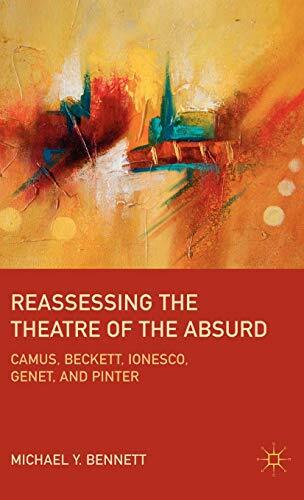 The same sort of assumptions are made in Mr. Bennett’s analyses of works by Camus, Ionesco, Genet, and Pinter—the other playwrights he uses to attempt to prove his point. The major problem with his scholarly work is his failure to understand the artistic process. He comes across as a person who has never been deeply involved in the arts as anything more than an audience member. An artist’s creative impulses are most often unplanned, unpredictable, and not fully understood—even by the artists themselves. Skill, inspiration, intellect, and a handful of other unseen forces—and not some Freudian or Jungian thought pattern—guide the artist’s pen. Setting up and arguing with a straw man is a good philosophical technique. The problem here is that the straw man appears to have won the argument.